Galen Cranz has written an engaging treatise and manual for designers on how to do research that would be useful in their practice. A design educator with a background in sociology, Cranz brings over four decades of teaching experience in architecture programs in writing this book. She believes that “buildings, spaces and objects should be designed and evaluated based on a deep understanding of cultural practice”. The study of cultural practice entails learning about “information and ideas people use to guide their everyday behavior” (p. 3). Semantic ethnography elicits cultural meanings–knowledge learned and shared. Why and how is the understanding of cultural knowledge useful in design? Designing for the universal man is proved to be a fallacy. Cranz advocates the focused study of relatively small ‘sited micro-cultures’ for understanding the relationships between people and places, in other words between material and non-material cultures. While other researchers such as John Zeisel (2006) have promoted doing research for post-occupancy evaluations of buildings, Cranz believes that ethnographic research should be a key part of the creative process of design as it empowers the designer in fostering change and envisioning a new and better future. The book is a treatise and manual since ethnography is both a theory and method. It is grounded theory, induced from empirical data (Strauss and Corbin, 1994). It explains but has no predictive power, is non-deterministic as it aims at finding co-relations, not causal relationships. It is particularly useful in studying emerging hybrid cultures and spaces of in-between, characterized by fluidity of roles and rules of engagement. Grounded theory rests upon the discovery of patterns and in design research, or research in service of design, desirable change in the future is predicated upon a thorough understanding of the present. Through ethnographic research “designers have access to the underlying mental structures of the peoples for whom they design” (p. 11). Cranz mentions the importance of communication theory in uncovering how space and built form organize social life. For example, an understanding of how the built environment facilitates the territorial instinct, frames social interaction, and influences emotions is necessary when the goal is to promote a sense of community. The book is a manual as it guides the researcher step-by-step in identifying a cultural setting, interviewing and coding data, creating taxonomies, reviewing relevant literature, operationalizing concepts, and translating them into design. Detailed guidelines on writing up the research project and making visual presentation in the form of a poster/ video are given along with the grading criteria. Each chapter has a parallel narrative in a box that either explains theory or is a guide to action. Nearly half of the book consists of interesting ethnographies by students in Cranz’s undergraduate course on Social and Cultural Factors in Design at the University of California at Berkeley. They illustrate the book’s premise that the built environment is a cultural artifact with symbolic meanings that can be deciphered by learning to see from the emic (insider) point of view. Semantic ethnography relies on informant’s descriptions of his/her worldview, using language as a medium to understand the cognitive knowledge systems that shape material culture. Each sited micro-culture is unique, requiring an open-ended research method to analyze its specific patterns. The ethnographer begins the interview process with the ‘grand-tour question’, followed by increasingly specific structural and attribute questions on the relationships and qualities of cultural components. The informant’s narratives are categorized into taxonomies or sets of meanings that are compared and contrasted to discover the central cognitive principle or theme of the micro-culture. Ethnography is description of a culture and refers to both the process and the product—the act of research and its outcome. The research project culminates in writing the ethnography as a narrative, and synthesizing the analytical components into a whole. There are many parallels between the design process and doing an ethnography. Both activities are open-ended and non-linear, moving between different scales, from whole to details and back. Both prioritize experience in their quest for validity and leave room for intuition in making decisions about the research/design direction. From the initial broad sweep emerges the solution space for design and focused theme. They are subjective in that the researcher/designer acknowledges her biases and brings her understandings upon the unique and site-specific situation to interpret and create. They are holistic descriptions of networks occurring in time and space, narrating stories of cultures and places. These stylistic similarities make it easier for the designer to wear the mantle of researcher and vice-versa. There are certain drawbacks to using ethnographic interviews as the primary research tool. Establishing a rapport with an informant and extensively interviewing her is time-consuming. Articulate informants who are willing to share their insights are not always easily found. Cranz alludes to participation observation in the cultural scene as a complement to ethnographic interviews but does not develop the multi-method approach fully. In my own teaching of ethnography as a research method for over 25 years, my students have explored the diverse subcultures of the public realm ranging from bars, cafes, barber shops, video parlors, libraries, train stations, bus stops, to parks and playgrounds. Behavior mapping and interviews have yielded rich data on patterns of activities in time and space, ways in which turfs are established, and episodic events that reinforce the sense of community. Designers are not trained to be patient and empathetic interviewers but are skilled observers of patterns, forms, shapes, and colors. Semantic ethnography relies on the spoken word. An exploration of how the non-verbal media of communication—behavior, signs, images—or the formal language of material artifacts can be deciphered using the ethnographic method would have been a welcome addition. 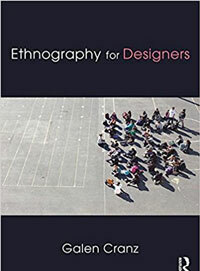 The ethnographic approach, as Cranz points out, is useful in postoccupancy evaluation and in programming a building’s functions but the book does not address how ethnography can be integrated into design studio teaching. Design research covers a wide range of topics but none as important as how the building or the landscape will be experienced and the social life it will sustain. Rapid Ethnographic Assessment (REA), popular in heritage studies, is less time-consuming and involves the local community in its multi-method approach— observation, interviews of key informants in focus groups, mapping—among others. It is particularly useful in the landscape design process in which the history and ecology of a site have to be studied for grounded speculations on its future. In my own work on heritage management of cultural landscapes in India, I have found REA to be an effective tool in interpreting local place-making traditions. Mapping of historic layers and of the vernacular landscape language, documentation of myths and legends, and participant observation in ritual enactments and festivals, are useful in assessing heritage value and for developing conservation proposals. The scope of design research is wide since design expertise, and research that can inform it, is needed in every aspect of the built environment. Scientism can obfuscate the kind of knowledge designers value to bring about change. Survey and quasi-experimental modes of research are unable to address the quality of human experience since their tools measure but do not probe adequately into the diversity and nuances of the human condition. No grand theories have emerged to satisfactorily explain, let alone predict, people environment relationships. Big data analysis does not lend itself to developing grass-root solutions. The ethnographic approach enables the researcher to dig deep into the local and the site-specific cultures that shape an individual’s lifeworld. Designers struggle to predict how meaningful their designs will be for the user. Cranz is very convincing in showing how doing semantic ethnography can be a start. Strauss, A. and J. Corbin (1994). Grounded Theory Methodology: An Overview. In Handbook of Qualitative Research (ed.) N. Denzin and Y. Lincoln. Thousand Oaks, California: Sage, 273-85. Zeisel, J. (2006). Inquiry by Design: Environment / Behavior / Neuroscience in Architecture, Interiors, Landscape, and Planning. New York: W. W. Norton. Amita Sinha is a Professor of Landscape Architecture at the University of Illinois at Urbana Champaign, USA where she has been teaching social and cultural factors in design since 1989. She received her Ph.D. in Architecture from the University of California at Berkeley where she studied with Clare Cooper Marcus and Galen Cranz. She used ethnographic research method in her doctoral dissertation on social and environmental change in housing in Northern India. Her ethnography of a small park in Lucknow was published in Architecture+Design, September 2005.